A group of researchers from the Federal Polytechnic School of Lausanne (EPFL) has developed a lightweight hand exoskeleton, controlled by brain impulses, which can help people with disabilities. A short description of the device was published on the EPFL website. 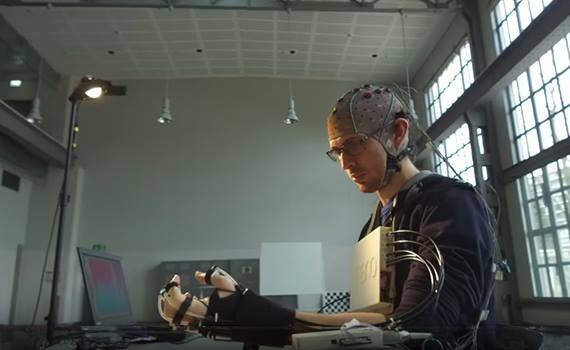 The development of Swiss scientists includes a soft EEG helmet with electrodes that fix the brain impulses, a control unit with motors that is placed on the patient's chest, and five connected metal tendon cables that stretch along the arm and are attached to the outside with the help of Velcro fingers, leaving the palm free. According to the researchers, in order to put on the patient all the elements of the system and prepare the exoskeleton to work, it takes only a few minutes, and the distinguishing feature of the development is its exceptionally low weight. In addition, the system supports different management methods depending on the user's characteristics. For example, an exoskeleton can be controlled by eye movements or using a smartphone with support for voice commands. A video demonstrating the exoskeleton in action was published on the YouTube channel EPFL. To date, the exoskeleton has been successfully tested in patients who have suffered a stroke and spinal cord injuries. Now the researchers intend to improve the system so that the exoskeleton can be used for rehabilitation and for doing household chores. There is no information on the possible timeframes for the development to enter the market.